As tributes poured in for Nicholas Winton, who, as a young stockbroker, had arranged for the rescue of 669 mostly Jewish children from what was then Nazi occupied Czechoslovakia before the outbreak of war in 1939, the right-wing press had, perhaps not by coincidence, an attack of selective amnesia over Britain’s less than tolerant past, and Winton’s own political orientation. What were at the time called the Czech Kindertransport took those children to the safety of Britain in eight special trains, travelling from Prague to the Hook of Holland before being ferried across to Harwich. A ninth train, scheduled to leave Prague on 1 September 1939, did not reach safety; almost all the children on board later died in concentration camps. Seventy years later to the day, that journey was re-enacted. 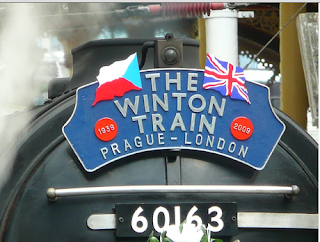 Nicholas Winton was there at London’s Liverpool Street station to see the train arrive. Some of those his actions had saved were on board. But what escaped the publicists then and now is not only that Winton was born Nicholas Wertheim, and his family were Jewish, having migrated from Germany in 1907, but that, in order to integrate into British society, they converted to Christianity. It would be unheard of today for anyone migrating to the UK to feel that they needed to convert to the majority religion in order to become more acceptable. But anti-Semitism was all too prevalent at the time, and for many years after Winton’s parents arrived: one only has to look at the fawning attitude of papers like the Daily Mail to the behaviour of the Nazis, even before the events of Kristallnacht. Today, that same Daily Mail has paid glowing tribute, managing to let slip that “What also made Nicholas unlike many of his contemporaries was that he was a committed socialist, and he became close to the likes of senior Labour figures such as Aneurin Bevan and Tom Driberg”. Winton was not only a socialist before the war, he was active in the Labour Party for many years afterwards, too. In 1954, he stood unsuccessfully for his local council in Maidenhead; then as now this was very solidly Conservative territory. To give an idea of why Winton might not have been elected, the town’s current MP, Theresa May, was returned at the last General Election with almost 66% of the popular vote. Her majority over the Labour runner-up was more than 29,000. 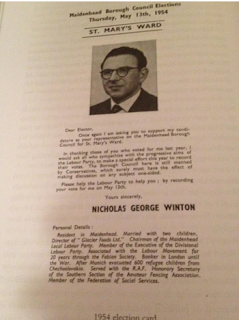 And Winton’s election address was typically modest. There is a statue of Winton at Prague’s main station. Memorials to the Kindertransport can be seen at Liverpool Street. And there is even a Winton memorial at Maidenhead station, unveiled by Ms May. Whether she let everyone know he was a Labour activist is not known. The BBC report tells only that he was a member of the local Rotary Club. 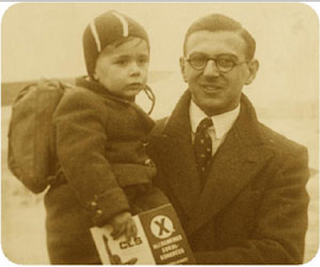 Nicholas Winton, son of Jewish migrants, humanitarian, committed socialist, long-time Labour Party activist, and thoroughly modest man, 1909-2015. That Daily Mail has come a long way. They don't (at least openly) hate Jews these days. But hang on......now they hate blacks and other slightly less dusky colours, aka benefits scrounging immigrants and "illegals." To say nothing of everybody outside the M25 ghetto. So it's a sort of balanced imbalance of the mind. A bit like "Hurrah For The Blackshirts!" Or, for that matter, Churchill in 1938 hoping someone with Hitler's mindset could "rescue" Britain. "Neocons" is actually a misnomer. Essentially those loonies never change, except to shift on to different targets - always the most vulnerable of course. Bullies and cowards are like that.